Who Leads Whom? is an ambitious study that addresses some of the most important questions in contemporary American politics: Do presidents pander to public opinion by backing popular policy measures that they believe would actually harm the country? Why do presidents "go public" with policy appeals? And do those appeals affect legislative outcomes? 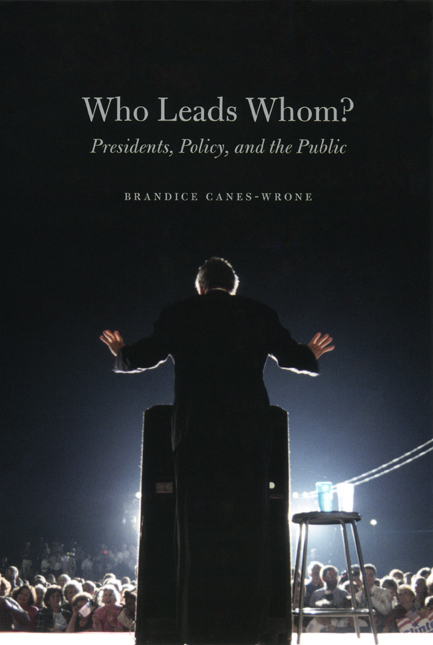 Analyzing the actions of modern presidents ranging from Eisenhower to Clinton, Brandice Canes-Wrone demonstrates that presidents’ involvement of the mass public, by putting pressure on Congress, shifts policy in the direction of majority opinion. More important, she also shows that presidents rarely cater to the mass citizenry unless they already agree with the public’s preferred course of action. With contemporary politics so connected to the pulse of the American people, Who Leads Whom? offers much-needed insight into how public opinion actually works in our democratic process. Integrating perspectives from presidential studies, legislative politics, public opinion, and rational choice theory, this theoretical and empirical inquiry will appeal to a wide range of scholars of American political processes. "The book’s findings are interesting and help us to better understand both the relationship between presidents and the public, as well as the nature of presidential rhetoric." "By explicitly considering how policy is made, Canes-Wrone substantially advances our understanding of when presidents will go public and how these appeals influence policy. Most important, she suggests that public opinion infiuences pohcymaking, but presidents neither manipulate public opinion nor follow it regardless of where it goes. Rather, in some sense, presidents act as agenda setters by playing a role in determining which policies the public will see as salient and Congress will ultimately act on."